We all know that even if the August 2 deadline passes without a deal, according to the Bipartisan Policy Center, the United States Treasury will still have enough revenue - about $172 billion - to pay for Social Security benefits, to pay for Medicaid and Medicare, to pay active duty military, and other national priorities. Let me repeat: the only reason…seniors and our troops will see their checks stop coming is if the Obama Administration decides to make other spending a priority, and if the Obama Administration chooses to hold our troops and seniors hostage - just so they can raise taxes. You know this is another amazing display of cynicism, or I guess the most charitable way I can say it: short-term memory. Related Content: Might These Be Scare Tactics? Jolly good show. Right on target, no punches pulled. 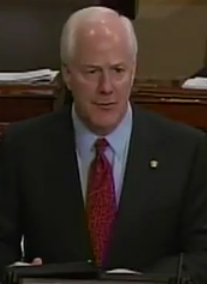 If the Congress had more like Sen. Cornyn we might yet survive obama.